High up in the Blue Mountains, the sound of a dobro and two acoustic guitars floats through the windows of an old wooden house and mingles with the bird calls in the mist. Two young men, and the man who taught them to play, exchange glances and nods when the magic happens – No Real Job are rehearsing for their next gig. Nigel Foote, James Church and Martin Foote are No Real Job – a guitar-based trio that plays traditional and contemporary material embracing folk/country/bluegrass styles. Hauntingly beautiful songs and tunes, often charged with the dark power of the minor chords, are skillfully performed with a rare touch. Although it?s early days, the combination of outstanding musicianship, award-winning songwriting skills and social conscientious brings a depth of interest to their performances that marks No Real Job as a band to watch. 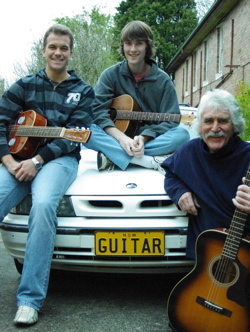 Nigel taught his son, Martin – and James – to play the guitar when they were children. As the years rolled by, the boys grew up and were inspired by different players – Martin by the guitar wizardry of Tommy Emmanuel, and James by the dobro playing of Jerry Douglas. Nigel Foote has won a number of songwriting awards for his work – including two Pater Awards – and gained a reputation as one of the Mountains finest songwriters. Fresh from a full-house concert at the 2013 Blue Mountains Music Festival, No Real Job are looking for more performance opportunities and gathering material for their first album.